Part 1 suggested that there were serious problems with Foucault’s definition of ‘governmentality’ in Security, Territory and Population lecture 4. Although his use of the term in later lectures is fairly coherent, his initial definition moves between a thing which he does not describe clearly (governmentality), a process or the result of the process (governmentalization), and how it works (a type of power). In short, two components of Foucault’s ‘definition’ are not really part of the definition, and the key component of the definition is unclear. If you did not already have a sense of what Foucault meant by governmentality, I suggested, you would probably not understand the definition at all! Here is how I tested these problems with the secondary literature on Foucault. I copied and pasted the first component of Foucault’s definition into Google. This produced 71 hits. I ignored blog entries, forum posts, Wikipedia, and so on, and examined just the 17 published sources. I don’t know how representative this is, and clearly it’s missing most of the key players in Foucault scholarship. But it gives a fascinating insight into just how relaxed some scholars are at dealing with Foucault. None of the authors explicitly criticises Foucault’s unclear and inconsistent definition. In some cases this is unsurprising: we don’t always criticise things we think are wrong, because to do so would deflect our readers from our main argument. But the paucity of explicit criticism about Foucault here troubles me. 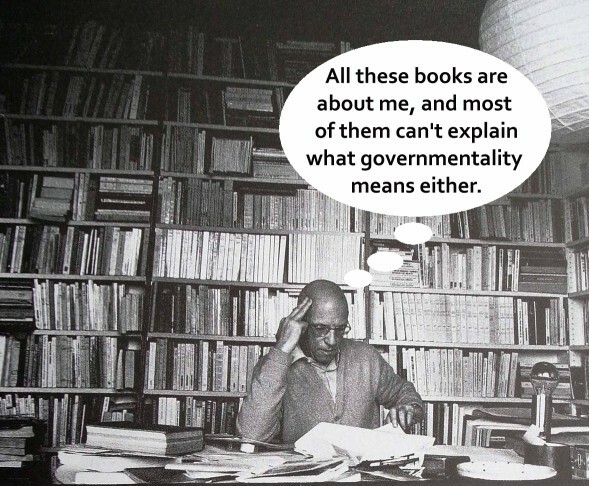 Eight studies quote all or part of Foucault’s definition but say little or nothing else about governmentality to help readers. Six are authors who quote all three components of the definition (Nickel, Besley, Niesche, Castro-Klaren, Halle, Amos), and two are studies which sensibly quote the first component of Foucault’s definition only (Baert & Carreira da Silva, and Ericson & Haggerty). I’m confident that one couldn’t read any of these eight sources – almost half of the sample – and understand what governmentality is. I’m not even sure how well all of these authors understand it. Six studies (Langley, Rose, Heath, Nettleton, Saraçoğlu, and Bennett) rightly focus only on the first component of the definition, but to a greater or lesser extent, each of those eight studies then misleadingly conflates governmentality with government – either Foucault’s notion of government, as a type of power, or a more orthodox notion of government. In other words, if my reading of Foucault and of these secondary studies is correct, then 14 of the 17 studies don’t really say what governmentality is and/or conflate it with something else. In my view, only three of the 17 studies depict governmentality in a way that seems both true to Foucault and in a way that readers could understand: Lipschutz and Fitzsimons, who quote all three components of the definition, and Pyykkönen, who only quotes the first. Each writer succeeds by fleshing out the initial definition in a useful way. So, what lessons can we learn? (1) Definitions can be hard to understand. They may need to be fleshed out with clarifications, examples, and further distinctions. (2) If an author does not do that herself, we may need to do it for her. (3) We may learn more from how an author uses a term than how she defines it. (4) We should be wary of taking an author’s definitions at face value. (5) The secondary literature may not be a critical guide to the primary literature. (6) The secondary literature may not even be a good guide to the primary literature. Hello. I am grateful for the clarity with which you articulate a frustration I have been having for a while now as I attempt to write and teach about governmentality. Could you please point me to the works by Lipschutz and Fitzsimons that you mention above, as I would like to review their accounts of governmentality? Thanks, also, for a much-needed laugh today, as those photos captured well my mood. Hi Michelle, and thanks for the kind words! The methodology of political theory: can political science help?